Helmicide granules - 1 kg polymeric can, 0.5 kg multilayer paper bag; Helmicide tablets - 100 tablets in a carton. 1 tablet contains albendazole - 360 mg and oxyclozanide - 175 mg (as active ingredients), as well as excipients. 1 g of Helmicide granules contains albendazole - 200 mg and oxyclozanide - 70 mg (as active ingredients), as well as excipients. Oxyclozanide (a component of the drug) with significant trematodocide properties has harmful effect on all development phases of Fasciola spp., Paramphistomum spp. and Dicrocoelium lanceatum. Mechanism of action includes phosphorylation damage, decreased activity of fumarate reductase and succinate dehydrogenase in trematodes causing paralysis and death of a worm. Albendazole is active against mature and immature gastrointestinal and pulmonary roundworms, as well as against cestodes and mature trematodes. Ovocidic action of this active ingredient allows to lower contamination of pastures by worm eggs. Antihelmintic albendazole action is caused by disorder of carbohydrate metabolism and microtubular function in worms causing their death and excretion. • cestodiasis (monieziasis, avitellinosis, thysanieziosis). Increased individual sensitivity to the drug components. Do not use within lay period or the first half of pregnancy, as well as in contagious and debilitated animals. 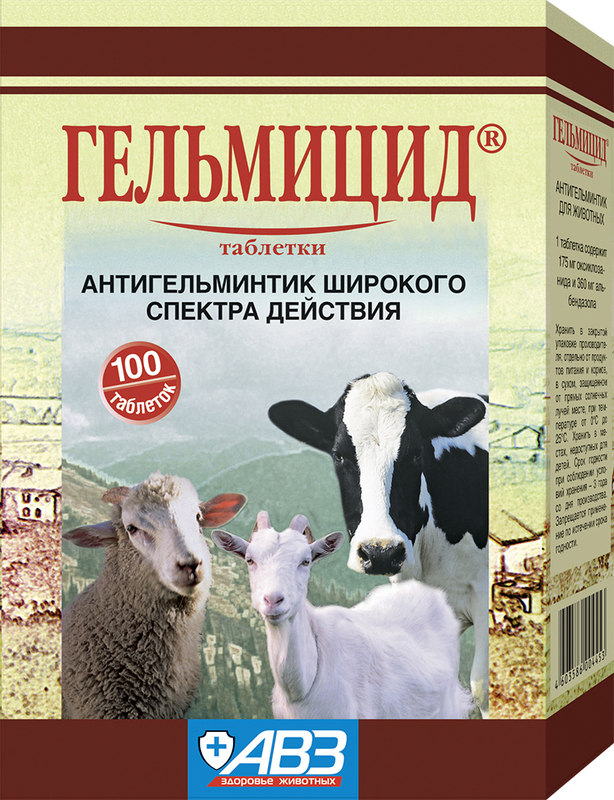 • sheep - 1 tablet per 45 kg (fasciolasis, dicroceliasis, paramphistomidosis and protostrongylidosis); 1 tablet per 70 kg (cestodiasis and nematodosis). 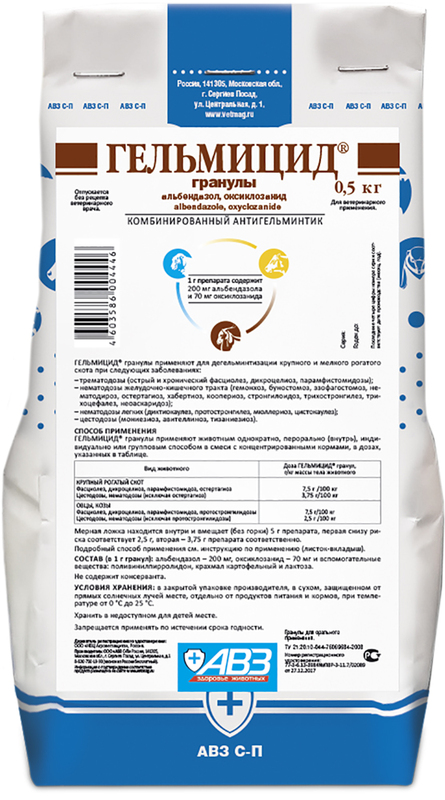 • cattle - 7.5 g of granules per 100 kg (ostertagiosis); 3.75 g of granules per 100 kg (other types of nematodosis and cestodiasis); 10 g of granules per 100 kg (fasciolasis and dicroceliasis); 12.5 g of granules per 100 kg (paramphistomidosis). 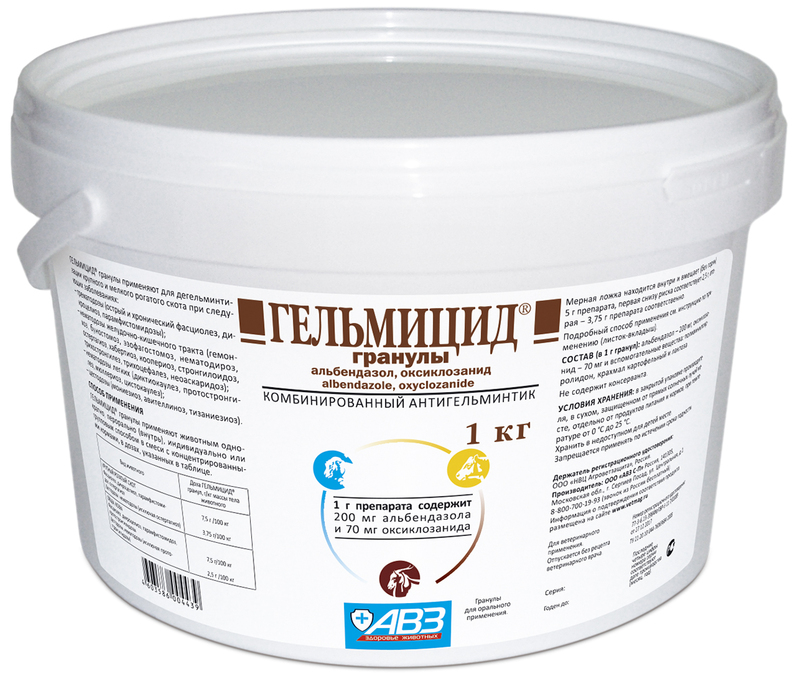 • Group administration: mix batch of Helmicide granules (aimed at ≤100 animals) with concentrated feed (cattle - 0.5-1.0 kg per animal; sheep and goats - 150-200 g per animal). Fill feeders with the obtained medicated mixture providing animals with free access. Previous starvation diet and cathartic administration are not necessary before deworming. Adverse events and complications are not observed in case of administration as per package insert. Uncommon individual reactions (depression, excessive salivation, diarrhea) spontaneously disappear. Additive drug administration is not required in such cases. Farm animals are allowed to be slaughtered for meat not earlier than 21 days after the last drug administration. Milk of milking animals is esculent not earlier than 4 days after deworming. Meat of compulsorily slaughtered animals and milk received before stated period termination can be used to feed fur animals. Store in closed original package. Keep out of the reach of children. 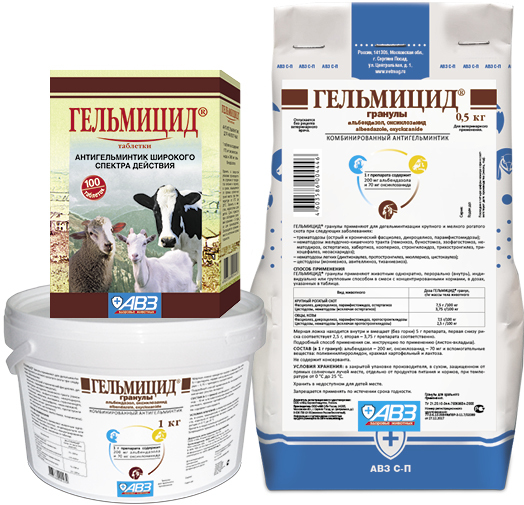 Store separately from food and animal feeding at 0-25°С. Protect from direct sunlight and moisture.